Stocks of European eel (anguilla anguilla) have plummeted 90 percent in three decades as mankind has developed the wetlands and dammed the rivers it needs to grow and feed in, and experts fear criminal gangs smuggling the lucrative fish are pushing it toward oblivion. Despite growing alarm from conservationists, hundreds of tons of eels are still legally and illegally fished each year. In France — which catches more of the fish than any other EU state — the issue has taken on political dimensions. “There’s around 10 percent of stocks left compared to 30 years ago due to habitat loss and what we’ve done to the migration pathways in Europe,” Andrew Kerr, chairman of the Sustainable Eel Group (SEG) that works to conserve the species, told AFP. The eel’s vertiginous decline has provoked some action from governments and law enforcement agencies. It is now listed in the CITES international convention on trade in endangered species, resulting in strict national catch quotas. The problem, according to Michel Vignaud, head of fishing regulation at France’s National Biodiversity Agency, is exploding Asian demand for a product viewed as both a delicacy and an aphrodisiac. “We cannot legally export eels outside the EU, but the prices are different in Asia. There is a real Asian demand for eel,” he told AFP. 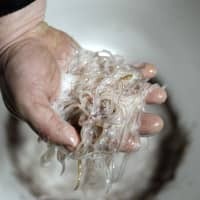 The U.N.’s Food and Agriculture Organization said that in 2016 China produced close to a quarter of a million tons of eel for consumption, far ahead of Japan — where eating eel is seen as bringing good luck and fertility — and the EU. 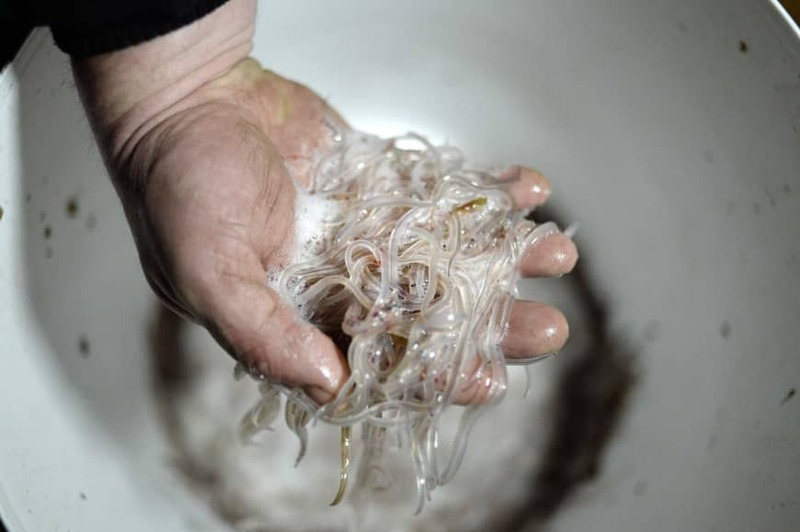 The bloc’s law enforcement agency EUROPOL estimates as many as 100 tons of baby eels — known as glass eels for their translucent skin — are trafficked abroad each year: equivalent to around 350 million fish. “Glass eels trafficking involves environmental crime, smuggling, document fraud, tax evasion and money laundering,” a spokesman told AFP. The live eels are largely caught — legally or otherwise — in Western Europe before being smuggled eastwards in vans or lorries, often falsely labeled as nonendangered fish, police and conservationists say. Criminal gangs then divide the eels into suitcases, up to 50,000 of the tiny fish per bag, which are then flown by commercial airliner to Asia. The fish are grown in special farms to their full size — up to a meter and a half — and then sold to market for the equivalent of 10 euros each. The European eel’s extraordinary life-cycle begins in the topaz waters of the Sargasso Sea. The eggs drift on the current across the Atlantic, often taking up to two years to reach the feeding grounds of Europe. The baby eels swim up rivers where they live for up to 25 years, feeding on larvae and worms until fully grown before embarking on the 4,000-mile (6,500-km) journey back home to the Caribbean, where they breed and finally die. But they are under threat from a host of man-made dangers, including illegal fishing, pollution, and the estimated 1.3 million river barriers blocking their path across Europe. “Our hope is that any eels still alive are left alone by humans,” said Charlotte Nithart, head of the Robin des Bois conservation group. She said that France’s current legal eel quota — 60 tons per year, of which 60 percent must go to restocking efforts — was contributing to the species’ decline. “We have never said that trafficking alone is responsible for the disappearance of eels,” she said. For Guillaume de Preillec, who represents the local fishing committee in Brittany, quotas are “justified” for those whose livelihoods depend on the eel fishing season, which began across France last week. “If you are in commercial fishing people tell you that when you fish more you earn more. So the fishermen always want more,” he said. As the numbers of fish arriving on Europe’s shores goes down, smugglers are taking greater risks to sate voracious Asian demand. “Trying to control the traffickers is getting more dangerous. These are people who operate on the sidelines of mass organized crime,” said Vignaud. EUROPOL has scored a number of major hauls in recent years, including Spanish police busting an eel-smuggling gang in possession of 350 kg of glass eels in April. But despite such seizures and a handful of ongoing trials, campaigners say the penalties remain flimsy compared with those for other trafficking crimes. “EUROPOL can act on the level of customs but there’s not a European intervention force to fight trafficking and traffickers,” said Nithart. Eels are mentioned in England’s 11th-century Domesday Book and used to be an accepted tax payment in medieval times. efforts to save the threatened species, there are fears for the future of one of the world’s most storied fish. “One of the sad things about today in general is how human beings are losing touch with nature, and the eel really symbolizes this,” said Kerr.